I went into this book blind. I had seen the cover and heard of the author, but hadn’t read any of his books and didn’t know what this one was about until after I started listening. Annalee Ahlberg, a woman who has issues with sleepwalking, goes missing. She leaves behind two daughters and a husband who must come to terms with her disappearance. Told from the point of view of her eldest daughter, Lianna, the listener gets to go along for the ride as the search continues and the police try to decide if Annalee met with foul play, or possibly harmed herself in her sleep. The truth ends up being neither, and is nothing I saw coming until right before it was spelled out for me. 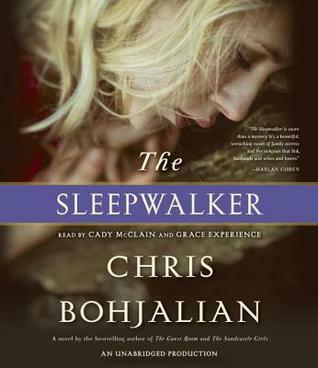 The Sleepwalker is equal parts mystery novel and family drama. Everyone has their secrets, and Lianna isn’t sure who she can trust. I wish it would have moved along a little more quickly, but overall it was a good story. I will look for more by Chris Bohjalian. The narration was not so great. The main narrator was soft-spoken, and her voice fit the mood of the story very well, but she paused in odd places and put emphasis on what felt like the wrong word in many sentences. This was jarring and distracting. There were also brief passages at the beginning of each chapter read by a 2nd voice, which I found very irritating. In all fairness, these passages were apparently journal entries, and the 2nd voice did help to distinguish them from the rest of the story. I do think I might have enjoyed the book a little more if there had been different narrators, however. Thanks to Penguin Random House Audio for providing me with a free copy of this audiobook. All thoughts and opinions expressed are my own. I’d have to think about the audio. It sounds like you might have enjoyed this book more if you had read it. That is the unfortunate thing when listening to an audiobook. It does sound interesting to me though. Thanks for the good review. I agree. Thankfully that doesn’t happen to me too often, but a bad narrator can taint my view of a book!